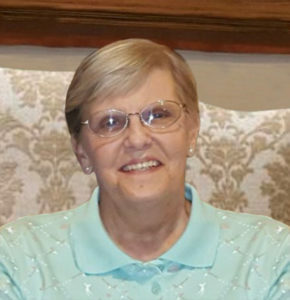 Carole Ruth Roseberry, age 79, of Adams, Wisconsin passed away Wednesday, January 30, 2019 at her home surrounded by her loving family. Funeral services will be 12 Noon on Saturday, February 9, 2019 at the Roseberry’s Funeral Home in Friendship, Wisconsin. Pastor Jasper Sellnow will officiate. Interment will be at the Mt. Repose Cemetery, Friendship, Wisconsin. Visitation will be 10:00 a.m. until the time of service on Saturday at Roseberry’s Funeral Home. Carole was born April 6, 1939 in Fountain City, Wisconsin to Lloyd Merton and Ruth Elizabeth (Faas) Moran. She attended Adams Grade School and later graduated from Adams-Friendship High School in 1957. Carole married Edmond Anthony Roseberry on December 27, 1958 in Adams Congregational Church. She had many jobs but daycare provider was where her heart was. Carole enjoyed golfing, bowling, mini-golf, reading, hiking, playing cards – especially sequence and chase the ace, and spending time with her family and friends. In lieu of flowers, memorials may be directed in Carole’s memory to Heartland Hospice. Carole was preceded in death by her parents, Lloyd and Ruth Moran; brothers, Thomas, Donald, Robert “Jake”, and John “Jack”; and sisters-in-law, Virginia, Marilyn, Emagene, and Sue. Special thanks to Heather Greiling of Gunderson Moundview Memorial Hospital, International Quality Home Care, and Heartland Hospice of Stevens Point for the loving care they provided Carole. Debby – I am so sorry to hear of your Mom’s passing. There’s a special place in all of our hearts for our mothers, just like there’s a special place in a mothers heart for her children. Carry the memories in that special place in your heart and she will be with you always. I am sincerely sorry for the loss of your mother. Prayers to your entire family. Uncle Tony, Debby, Connie and all of their loved ones. I loved Aunt Carole so very much! There has never been anyone like her and that spot in my heart will always be hers ♡ I miss you! I love you all! Connie and family, so sorry about your mom. and prayers go with you. Carole had an important role in my childhood and was always remembered fondly. Still always think of her making raisin bran muffins for us. So sorry for the loss and know she will be remembered. To all of Carole’s family. So sorry for your loss of Carole…such a sweet lady. May you find comfort in God, Family and Friends. Our thoughts and prayers are with you. Tony, Toby, and David–my high school friends. I am sorry for your loss of your sweet wife and sister. My deepest sympathy to all of you!! God will be with you! To the Roseberry & Moran Families………….My deepest sympathy for the passing of your dear Carole. May God Bless all of you during this very sad time. Prayers and thoughts are with you during this difficult time. So very sorry for your loss. Thoughts and prayers go out to you and your family. Your in my thoughts and prayers. May God grant you peace. I am so sorry for your loss. It has been so many years since I had seen any communication, but I was in school with Richard Moran. Please accept my sympathy. So sorry for your loss. Carole was a wonderful lady. Keep those fun time close during this time. Debby and Connie ~ I am so sorry for your loss. My mom conveyed memories of our parents together when they were young. We’ve known each other forever… and my heart goes out to you. Prayers, too. My sincere condolences and sympathy to Toni and Carole’s family so sorry for your loss. Debby, so very sorry to hear of your mom’s passing. I will be thinking of you and keeping you in my prayers. Sincere condolences to the family. We know you will cherish the memories always. OUR THOUGHTS/PRAYERS ARE WITH YOU. MAY THE LORD BLESS AND KEEP YOU. MANY “MEMORIES” OF CAROL AT A-F HIGH. So sad to hear of Carole’s passing. My heart goes out to all her family and friends…. you will remain in my thoughts and prayers. How hard it is to lose such a unique and precious person such as Carole. She has touched so many lives. As my childhood caregiver, you gave me my wings, and now you have your own…you will be missed. Many fond memories of the neighborhood family and the kindness of those children to a neighborhood waif. MY condolences to the family. So sorry for your loss, my sympathy to all of you. Peace and love to all of the loved ones.I still remember the old Carol,so full of life and goodness. My thoughts and prayers are with you and your family at this difficult time. I have many great and fun memories of Carole. So sorry for your loss. Our thoughts and prayers are with you all. She will be missed. Sorry for your loss. Prayers and hugs to you all. Our family is thinking of you all during this time of loss. Sending prayers your way. Connie and family, I am so very sorry for the loss of your mother. She sounds very special and will be greatly missed. Prayers to you and your families during this difficult time. Condolences. May you find peace during this difficult time sharing happy memories of your mom. We are so sorry for your loss, prayers to the family. We’re so sorry for your loss. Sending thoughts of comfort and peace to you all. Sending my sincere sympathy to Tony, Debby, Connie and family members at this time in your life. Carole was such a sweetheart. Spent many hours back in the late 60s watching Debby and Connie. Many Nice Memories of the Roseberry family. May God Bless you. To the Moran/Roseberry family…..Carol is now with the Lord, she was a sweet person and she will be missed by all who knew her. She grew up in our neighborhood and the whole family were friends. Prayers in her memory. Our prayers are with you. I know you all took such good care of her. So very sorry for your Loss Prayers for the family. Our sympathies to the whole family . So sorry for you’re loss. We used to celebrate birthdays in grade school. Mine is the 7th Kristas the 3rd Roberta the11th and Chanin the 8th. She was a sweet lady. My heartfelt sympathy for your loss, my thoughts and prayer`s are with you and your family during this difficult time of grief. So sorry for your loss. Thinking of your family. Sending prayers and thoughts to the family. So very sorry to you and all your family Connie! Love and prayers to you! With deepest sympathy, to all. Praying for His Peace & His Comfort. Thinking of you all with our deepest sympathy at this sad time. RIP Carole. She was a nice lady. So sorry for your loss. Carole was a fixture in the old neighborhood and I will miss her. Patti and I extend our deepest sympathies. Carole will always have special place in our hearts. She will be missed. Peace to you all. Sending our sincere condolences to you and your families with the loss of Carol. She will be missed by many. Thoughts and prayers are with you all. All of our sympathy! God be with you all during this difficult time! My sincere sympathy to all of the family. Deepest Sympathy Carole was a special lady and a fantastic community person. Prayers for family……..
Our sincere condolences and sympathy to all if Carol’s family. God Bless each one of you. Sending a big hug. Ross has many great memories of her and family from on Pine Street . So sorry for your loss. Prayers to the whole family.